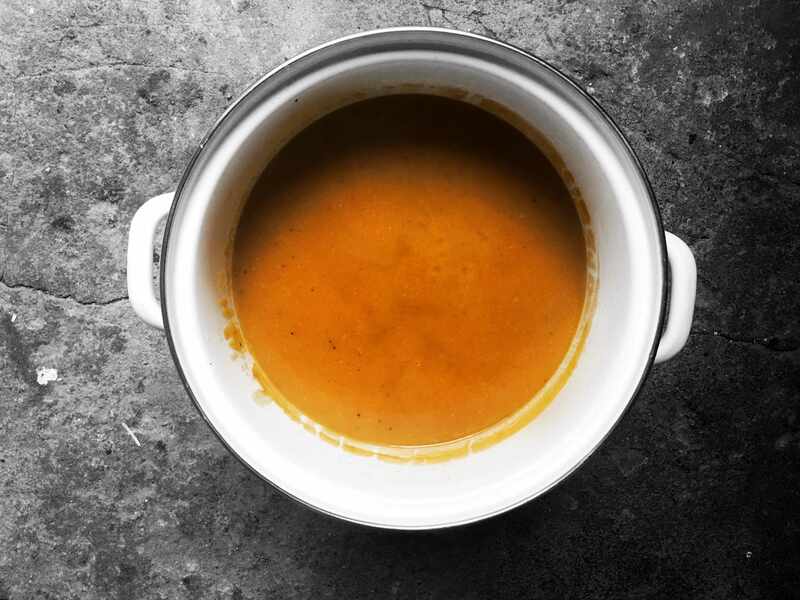 Soup, I can have it no matter the season, I’m a person who mostly craves warming and hot foods, so soups are almost always on the menu, and today I’ll be sharing one I simply adore. It’s so simple yet packed with so much flavour! Whenever I make this soup it ends up being a meal prep because one of the things I love about soups is that the flavours somehow get better with time, well until it starts smelling, then you should toss it, but it never comes to that! It’s also freezer friendly, just throw a batch in the freezer and forget all about it! Another reason why I love soup and especially this one in general is that every time I make it, it tastes different, in a good way of course. You can also add additional spices live cumin, or garam masala, maybe some herbs if you prefer. 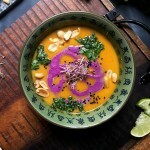 Just like many of my other recipes I highly encourage you to experiment, how much fun is that!? But don’t feel pressed to do so, the soup as it is works just perfectly. Now when it comes to serving this soup I sometimes like to go a little bit overboard. 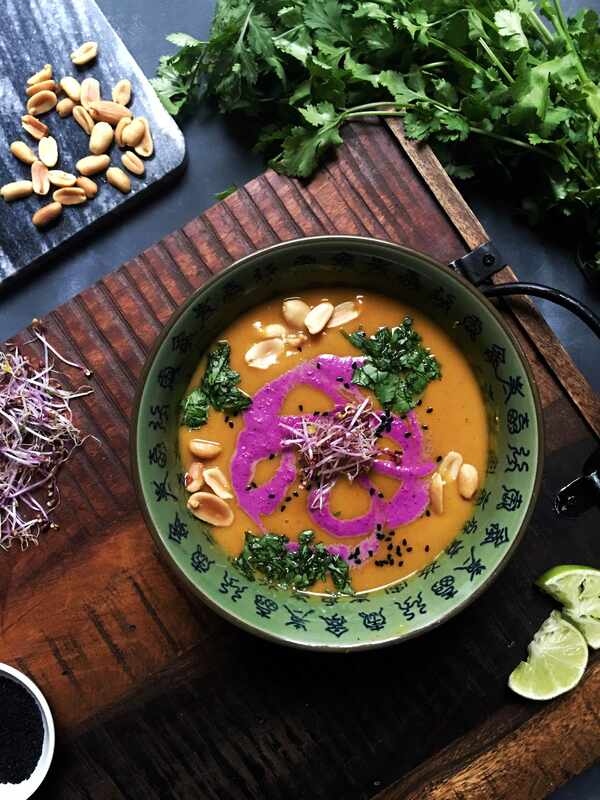 Pictured below you can see I topped it with some of my raw vegan purple “sriracha” hot sauce, chopped cilantro, peanuts, nigella seeds and purple cabbage sprouts for some additional nutrients. Of course feel free to keep it plain and simple, this way I often enjoy it myself. Or simple topped with some nuts or seeds for some added texture. Let me know if you liked the recipe in the comments below and if you decide to recreate this dish feel free to tag me on Instagram as I’d love to see your creations, and find me on Facebook! Start by (water) sautéing your onion and garlic, after this add the remaining ingredients and top with enough water too cover all the ingredients. Now add two cups extra and a can of coconut milk. Bring the pot to a boil and let it simmer on low until the potatoes get soft. Blend with an hand mixer (immersion blender) or in a regular blender in batches, just make sure when blending hot soup the blender it isn't airtight or it can explode, we don't want that! Enjoy! If you’d ask me what my most comforting types of dishes are I’d go with soups, curries and casseroles, I’m definitely a savoury type of guy. Since we’re in the middle of the holiday seasons it’s about time we start sharing some delicious comforting dishes to share with the entire family. See this is what’s so amazing about casseroles, they are the perfect dish to share with friend, families or random strangers on the street! I’ll be serving this for my family and friends during christmas, its easy, affordable and of course delicious! 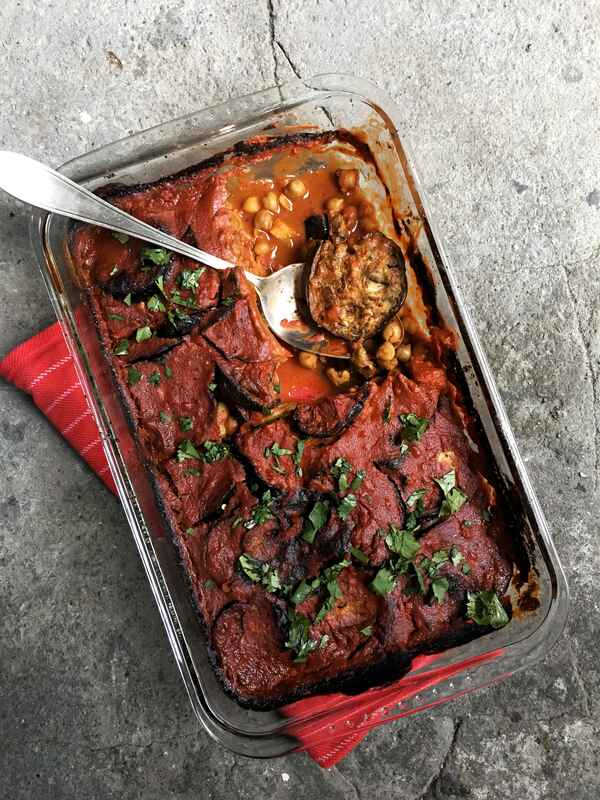 Every time I visit my sister-in-law she always makes the most delicious vegan dishes specially for me, one of my favourite dishes she makes for me is an eggplant dish similar to this from the oven, containing a tomato sauce and fried eggplants. No matter how many different dishes there are I always go for that one first! I love making dishes that spark my memory and this is definitely one, every time I eat it I’ll be reminded of the times I visit my brother and sister-in-law and their loving home. 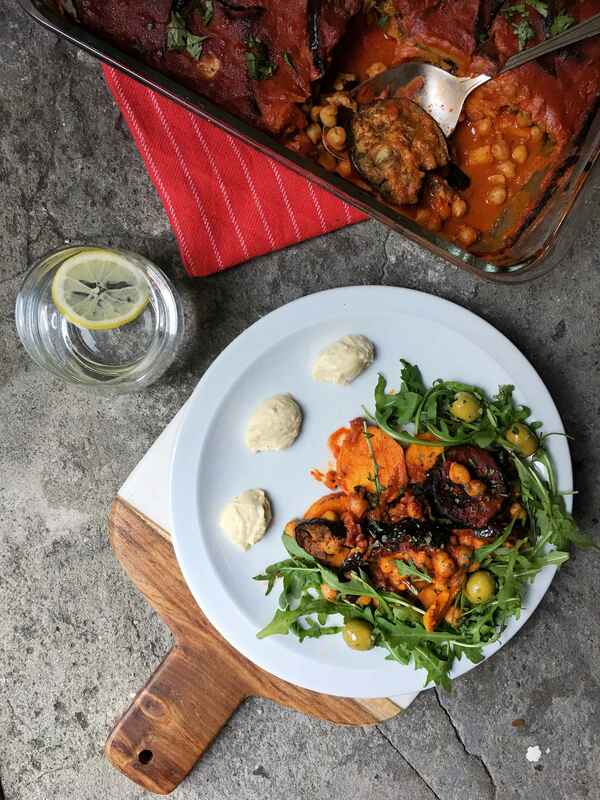 This casserole is a dish with a layer of sweet potato, chickpeas and baked eggplants topped with a delicious savoury tomato/coconut sauce. Instead of frying the eggplant I decided to bake it first to cut down the oil needed, especially since eggplant acts like a sponge. You can obviously sub certain ingredients if they don’t fit your taste. For example try using regular potatoes instead of sweet or maybe add zucchini and use a different kind of bean instead of chickpeas, there are so many options! If you are HCLF you can even try baking it without oil, I’m not an expert so I don’t know how this will work out, but feel free to let me know! Now let’s get baking! And feel free to leave a comment below sharing your favourite casserole dish with me, or to tag me in your recreations on Instagram and don’t forget to like my Facebook page. 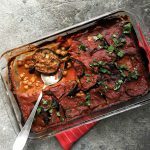 A warming and easy to make casserole perfect for the holidays, show your family and friends how delicious plant based foods are. First we start by making the baked eggplants (you can also fry them, but I like to bake them as this uses less oil). Preheat your oven to 175 degrees celcius and make the oil mixture by adding the spices to the oil in your casserole dish (add salt to taste), this way your dish gets greased for the second part of this recipe. 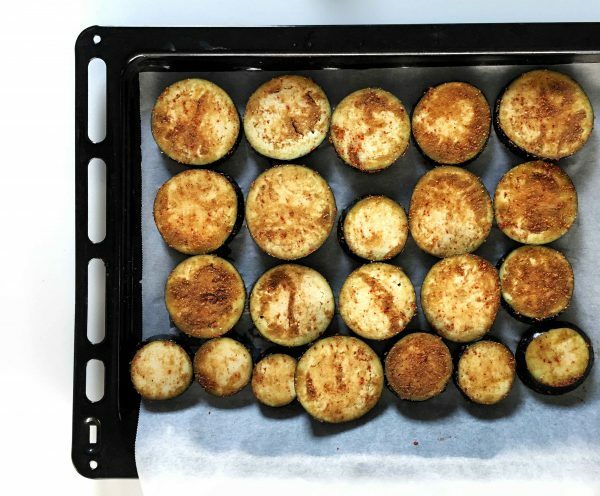 Slice the eggplants into about half an inch thick disks (or 1 centimeter) cover them all with the oil mixture and spread them out on a baking sheet covered with parchment paper. Bake them for about 20 to 30 minutes (depending on your oven) while flipping them halfway through. Remove them from the oven to finish the casserole. Increase the heat of your oven to 200 degrees celcius. Start by mixing the tomato sauce, garlic, coconut milk, ras el hanout, cumin and salt to taste. Now peel and cut your sweet potatoes the same way you did the eggplant, in disks. Place them on the bottom of the casserole dish, cover these with the drained and washed chickpeas. Now place your baked eggplant on top and cover it with the sauce. Bake it for about 40 to 45 minutes (depending on your oven). Remove the dish from the oven and it's ready to serve. Enjoy!